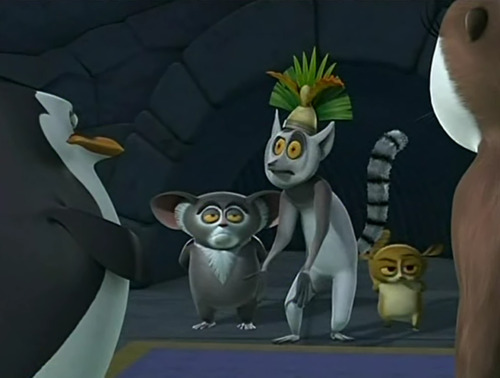 Mort is not amused.. आप know I totally have to make a dialogue for this.. Wallpaper and background images in the पेंग्विन्स ऑफ मॅडगास्कर club tagged: penguins of madagascar madagascar lemurs madagascar lemurs king julien maurice mort. आप know I totally have to make a dialogue for this. KJ: I was totally dreaming about being the last mammal on Earth and you wake me up! Skipper: Do I look like I care? Mort: T_T You woke the king and his feet with your screaming Marlene. Maurice: *totally not caring* Can I go to bed now? I think Mort saw William in his mort costume I put on him.